Inspired by the trains on Disneyland's Big Thunder Mountain Railroad, I created this plan for a 14' excursion car back in October of 2012. An online friend saw it and suggested he might have the perfect kit to use as a starting point. 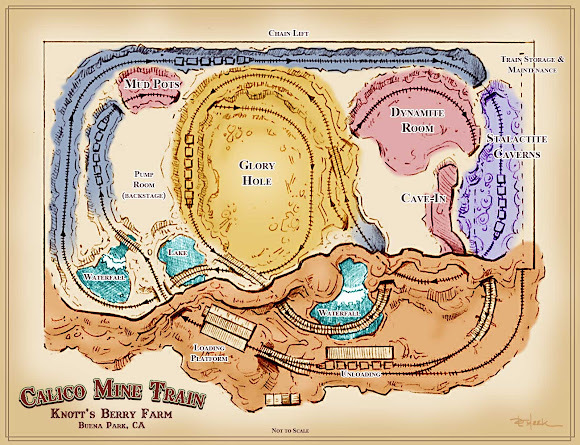 The trains on Disneyland's Big Thunder Mountain Railroad attraction feature distinctive gold and brown cars that are meant to evoke ore gondolas of a bygone era. 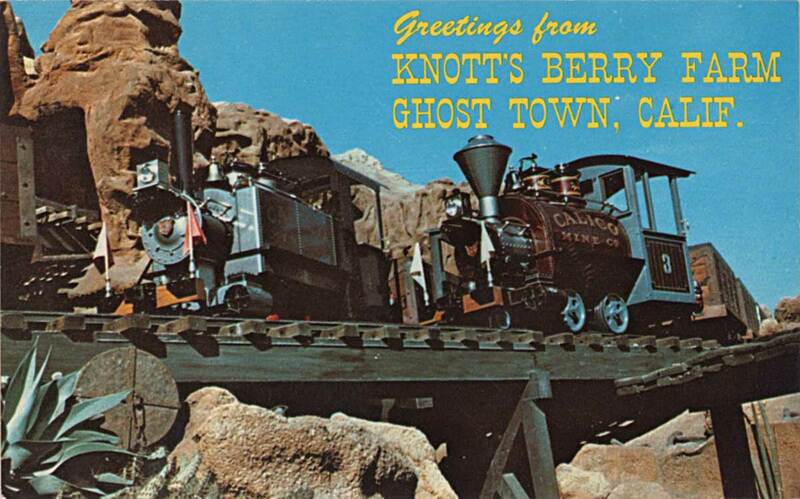 In reality though, they only remotely resemble any kind of equipment used on a real railroad. 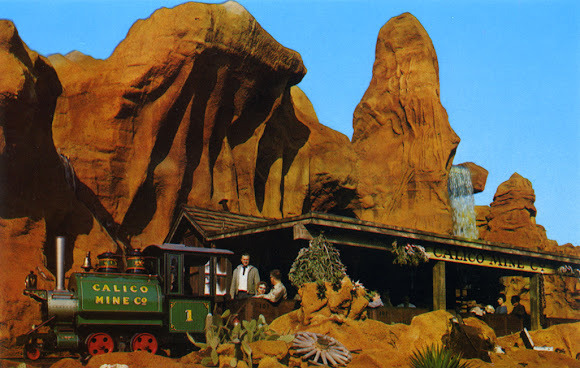 Since, in the world of Thunder Mesa, my railroad existed first and helped to inspire the attraction, it makes sense that the TMMC would have a short string of excursion cars converted from old ore gons. 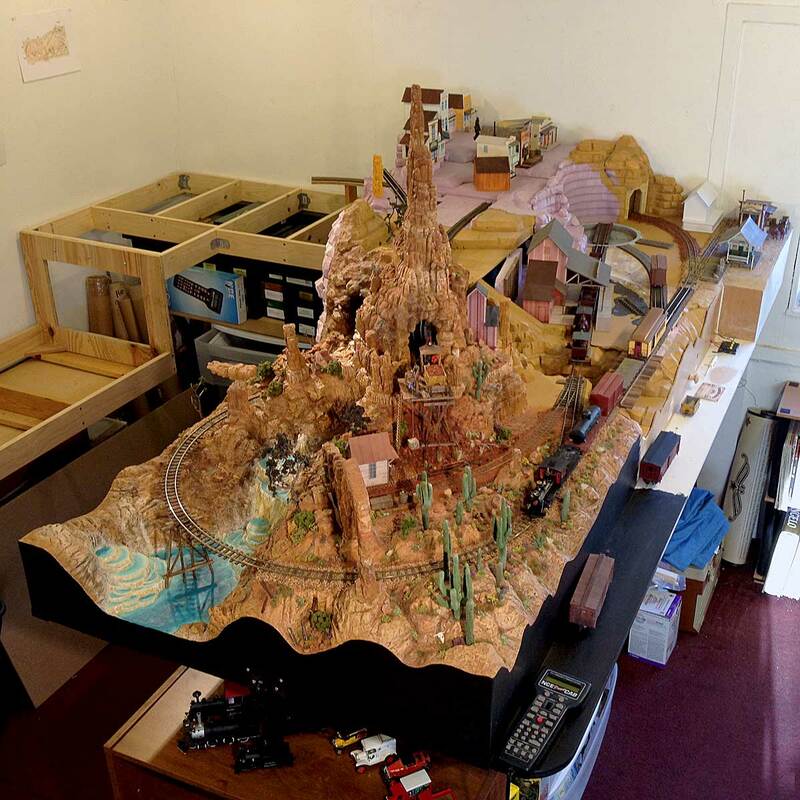 The challenge was creating something that could act as a believable "prototype" for the Big Thunder trains. 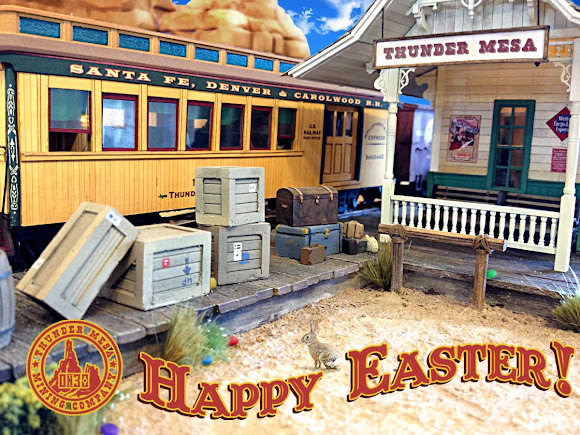 Canadian modeler Heath Trollope graciously asked me to review a kit for a 14' On30 flatcar that he plans on producing, suggesting at the time that it might be just the thing for the Thunder Mesa excursion cars I had talked about building. 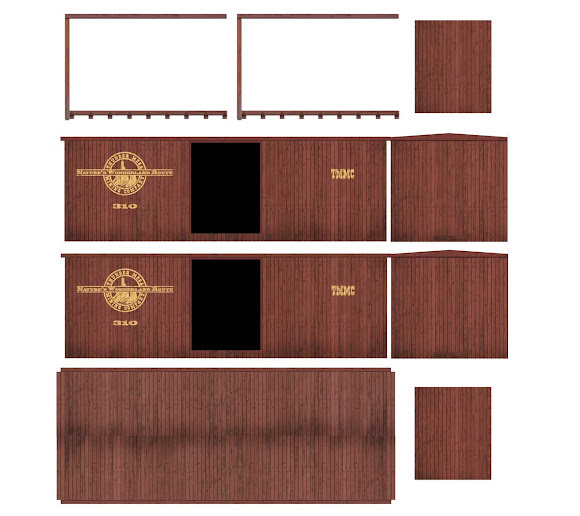 Since my original plan had been to cut down Bachmann flatcars for the job, I readily accepted the offer. Mostly because, A) I love getting free stuff, and B) I knew Heath would produce a quality kit that might be perfect for my needs. Below is a distilled version of how it went together. 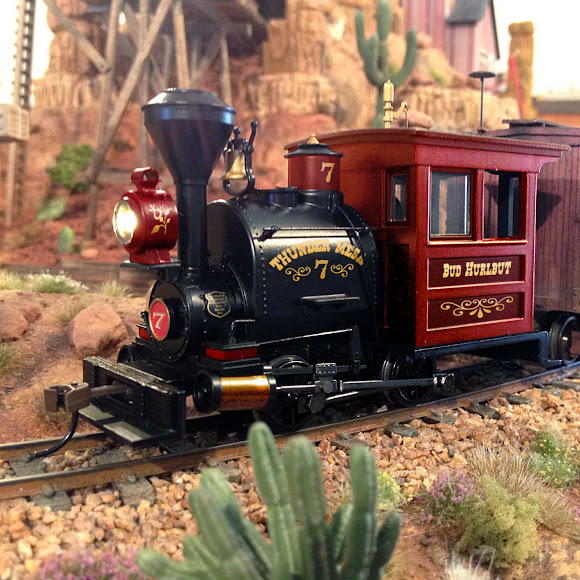 My full review and build thread can be viewed on the Railroad Line Forums. 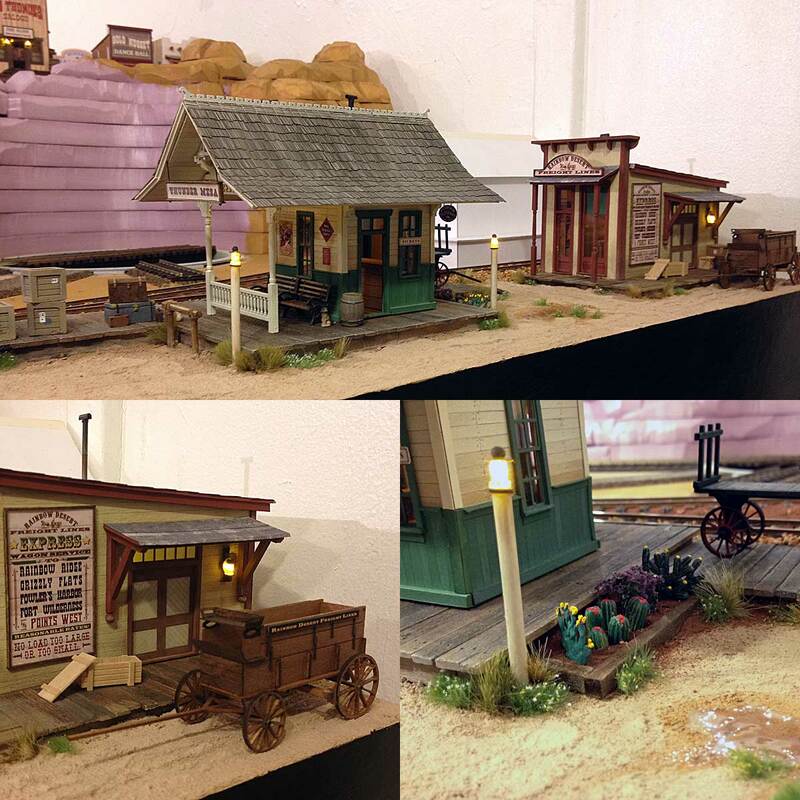 My sample kit consisted of a two-sided sheet of instructions, white resin castings for the under frame, some scale 2x8 decking, and a short length of music wire for the truss rods. Trucks and couplers are not included so I picked up some Kadee HO #501 trucks and #5 couplers as the instructions indicated. After a couple evenings of enjoyable assembly here is the completed kit just before trucks and couplers were added. The resin castings are very well done and nicely detailed. 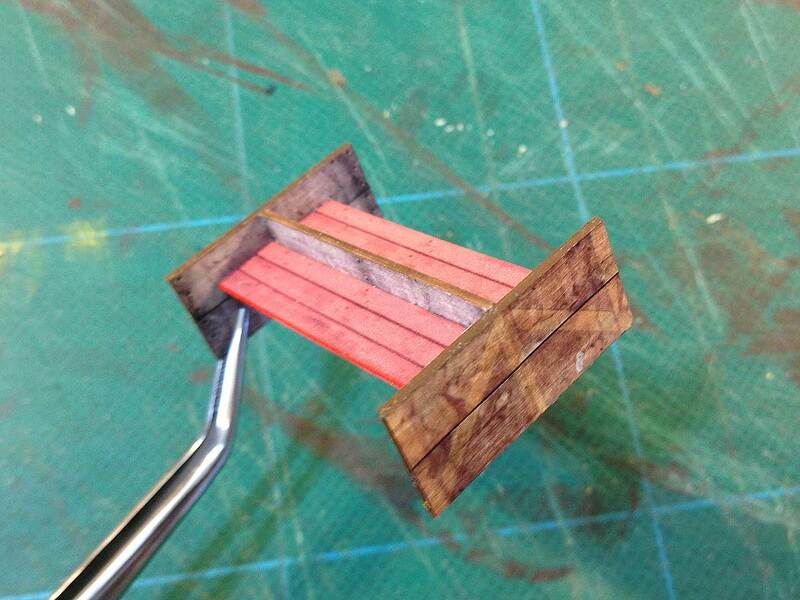 I stained the decking boards with a rubbing alcohol and shoe dye mixture. The completed car ready to go to work on the railroad. All in all this is a great little kit that could be the starting point for a wide variety of funky little cars; gondolas, tank cars, pulpwood buggies, even a boxcar or caboose. I don't have sales information on the cars yet, but when I do I'll post a link here on the blog for anyone who might be interested in building a few for themselves. 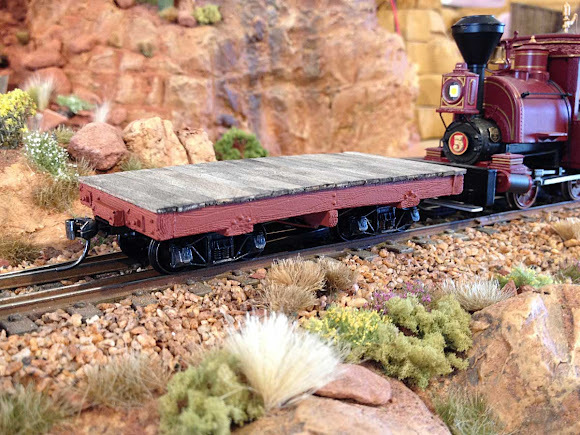 Heath was right of course, and his great little kit was the perfect starting point for my long delayed excursion train project. I've built one car thus far as a prototype and plan to add four more in the not too distant future now that the bugs have been worked out. My plan above shows two different styles of car, a basic and a deluxe model with a shade canopy and seats facing both forward and back. Though the basic car more closely resembles the Big Thunder trains, I decided to build a car with the deluxe seating pattern, sans canopy, since it makes more sense for the point to point operation I have planned. Still, I tried to capture the flavor of the Big Thunder cars and I hope there is enough of a family resemblance there that folks will understand what I'm getting at. Once again I turned to printed photo-textures for the car sides and benches. I took some careful measurements of the completed flatcar and then laid out all of the interior and exterior pieces I would need in Adobe Photoshop. These were printed out on HP Premium Presentation Paper and then laminated to smooth 100 lb bristol board with 3M 45 All Purpose Spray Adhesive. Each bench/bunker was created as a separate sub-assembly. 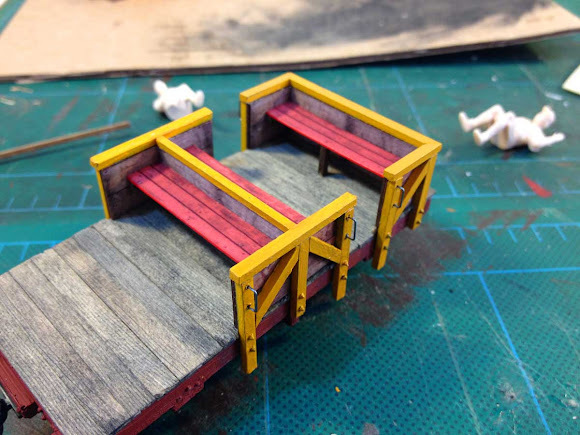 Here are the pieces for the center benches with the exterior and interior walls glued back to back and the edges painted a matching color. The assembled center benches before trim was added. 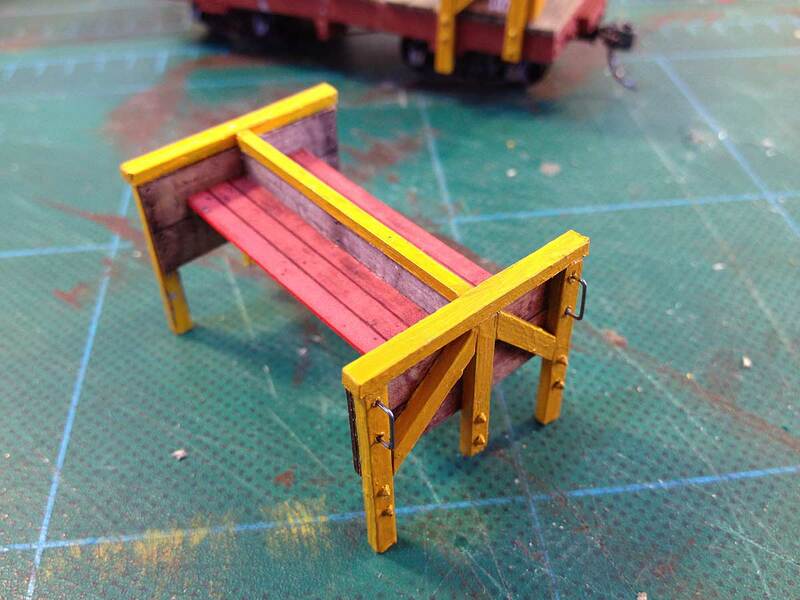 The benches are reinforced underneath with 1/16" square strip wood. The completed center bench assembly ready to be installed on the flatcar. The trim pieces are scale 4x6" stock painted with acrylics. Music wire grab irons and Grandt Line nut/bolt/washer castings round out the details. 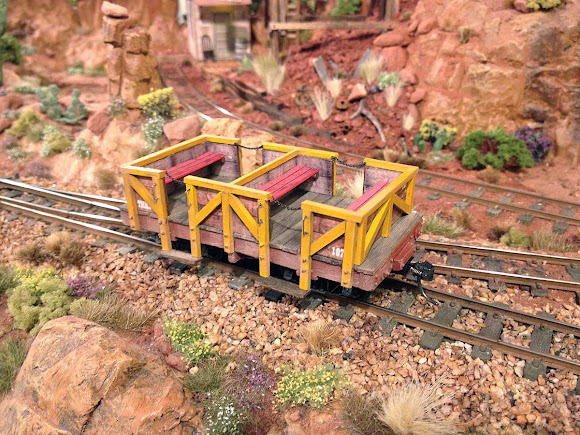 Two of the bench/bunker sub-assemblies cemented to the flatcar deck. The color scheme and diagonal bracing are direct references to the Big Thunder cars. The completed car ready to go to work on the layout. Final details include safety chains and steps made from leftover 2x8 stock from the flatcar. A little dry-brushing with acrylics helps bring out the cast-in detail on the car frame and a light dusting with colored chalks adds a needed dose of weathering. 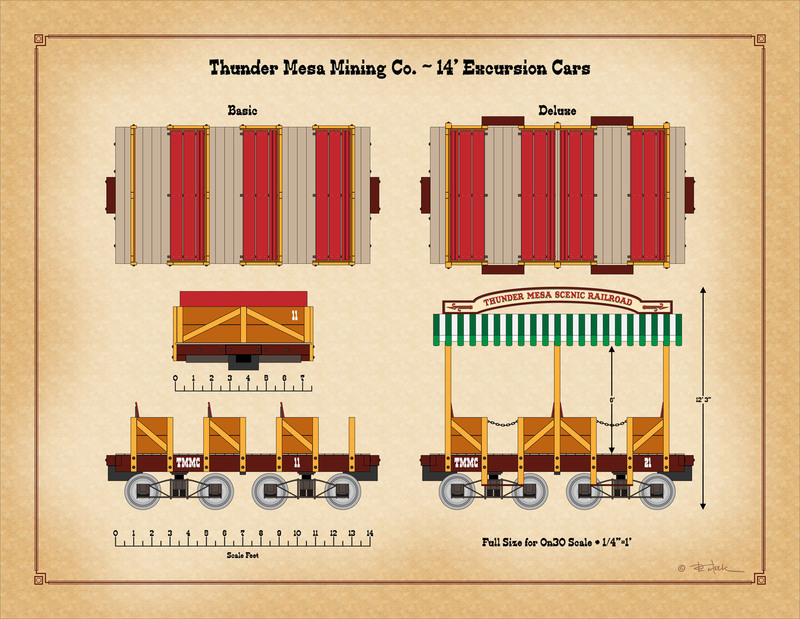 During construction, the flatcar developed a slight bow in the middle. It bothered me at first but now I kind of like it. 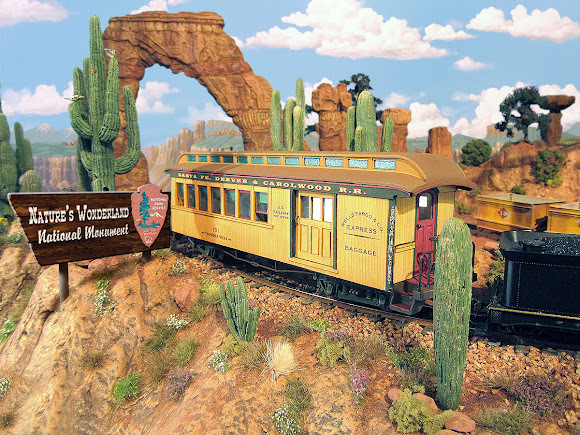 Each excursion car can hold up to 12 O scale people. These folks look a little pale and could use a paint job. All Thunder Mesa passenger equipment is numbered in the 100 series, starting with Combine 101. These excursion cars will be 107 - 111. Now it's back to the car shop to build four more! Okay! That about wraps it up for this week's project. Thanks for following along. And very special thanks to Heath Trollope for getting me rolling with his excellent flatcar kit! As always, questions and comments are welcome. Thanks for checking in, folks. Adios for now! 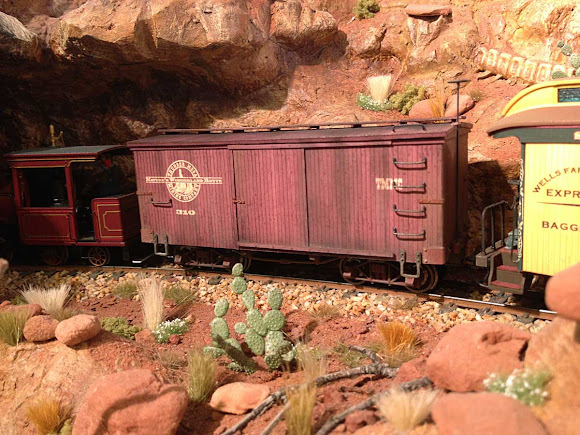 Proudly bearing the Nature's Wonderland herald, Thunder Mesa boxcar #310 makes up part of the daily mixed heading into Rainbow Caverns. 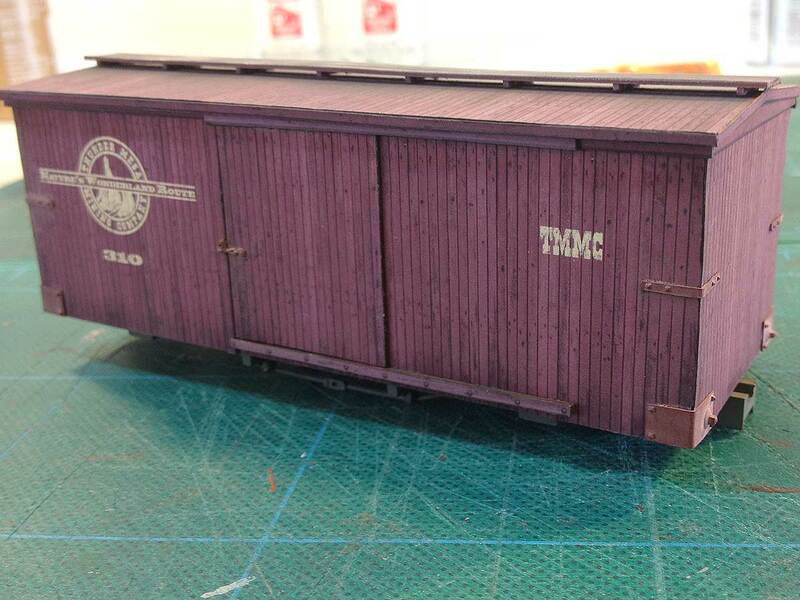 The car was built on a cut-down Bachmann frame using printed photo-textures for the walls, roof and doors. 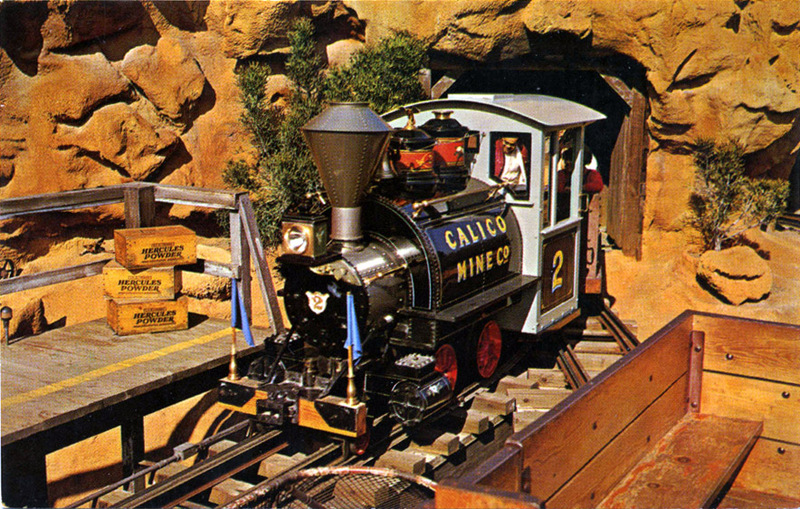 After a successful experience using printed photo textures to build Combine 101 for Thunder Mesa (see the 2014 On30 Annual), I've turned my attention to some other rolling stock projects that could also benefit from this technique. Here's how I put together a freelanced 20' boxcar for the TMMC. 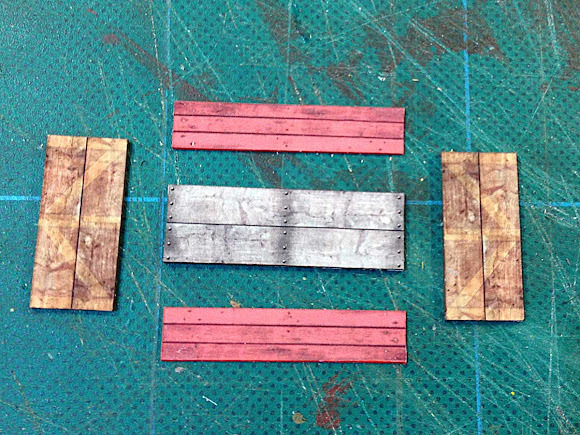 Using photo-textures of real wooden planks downloaded from cgtextures.com, I laid out all of the parts to be printed in Adobe Photoshop, adding graphics and text, color correcting, and adding some weathering to the boards. The car was designed to be built on a Bachmann On30 freight car frame cut down for the 20' length. Several copies of the plan were printed out on 120g HP Premium Presentation Paper using an Epson R1800 inkjet printer. 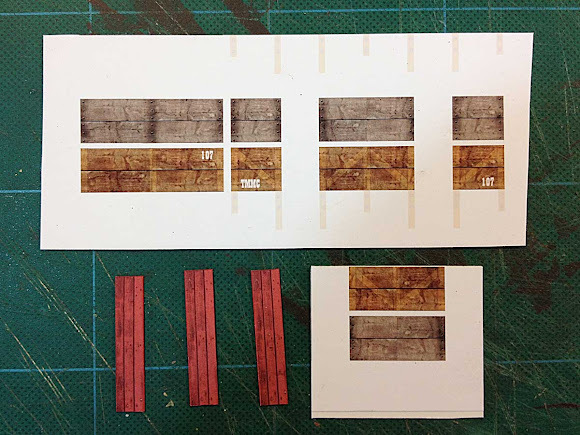 Printed sheets were then laminated to 1/16" thick illustration board using 3M 45 All Purpose Spray Adhesive, then the walls cut out with a sharp #11 hobby knife. Thinner pieces like the door and top rail trim were laminated to 100 lb bristol board and then cut out. Before assembly, the edges of all pieces were painted a dark reddish brown, a vital step in creating a realistic looking model. 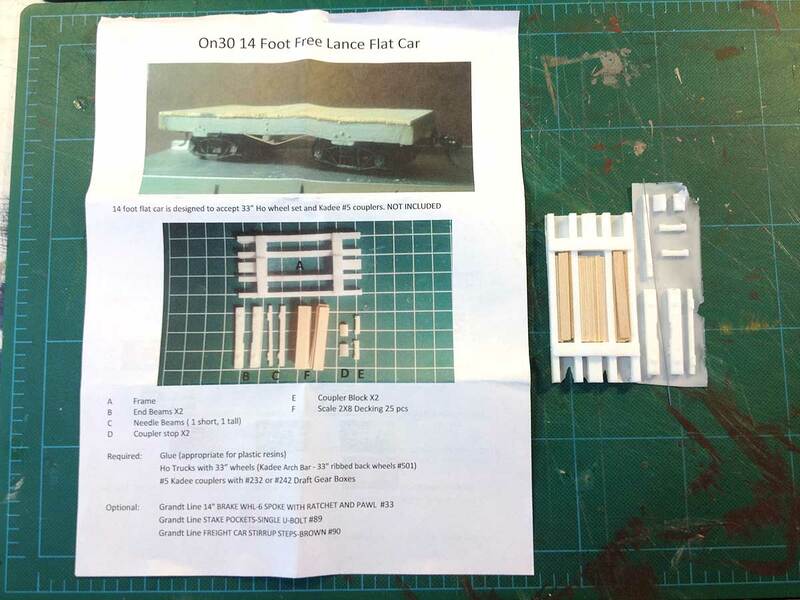 The four walls, doors and top pieces were then cemented together with white glue to form the basic car. 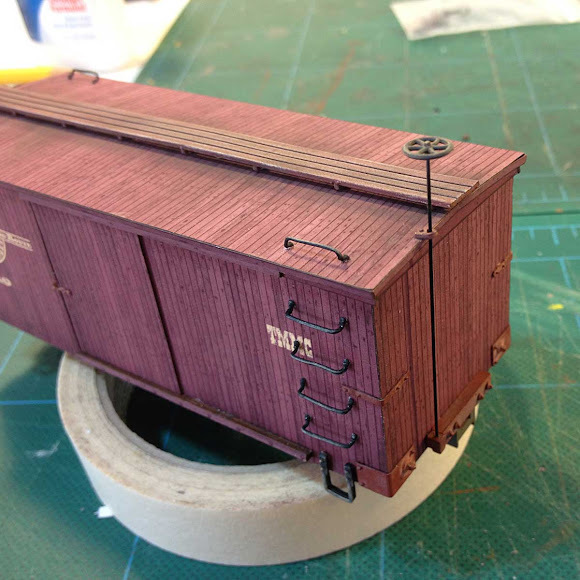 By removing a few scale feet from just inside the bolsters, a Bachmann On30 freight car frame was cut down to the 20' length. A new deck was created by scribing plank detail into illustration board and the frame was cemented in place. 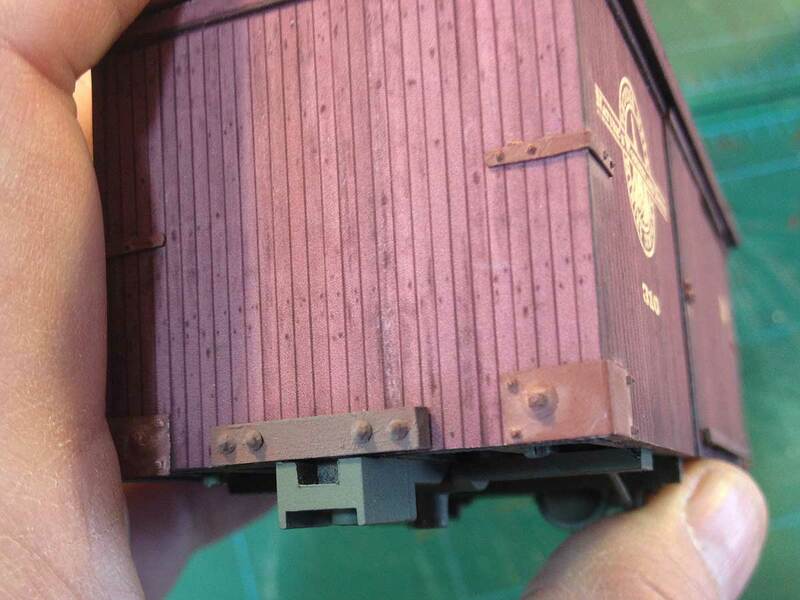 Once the glue was dry, the completed under-frame was airbrushed a dirty red-brown. Turning the frame over, a weight was cemented in place to help the car track well. 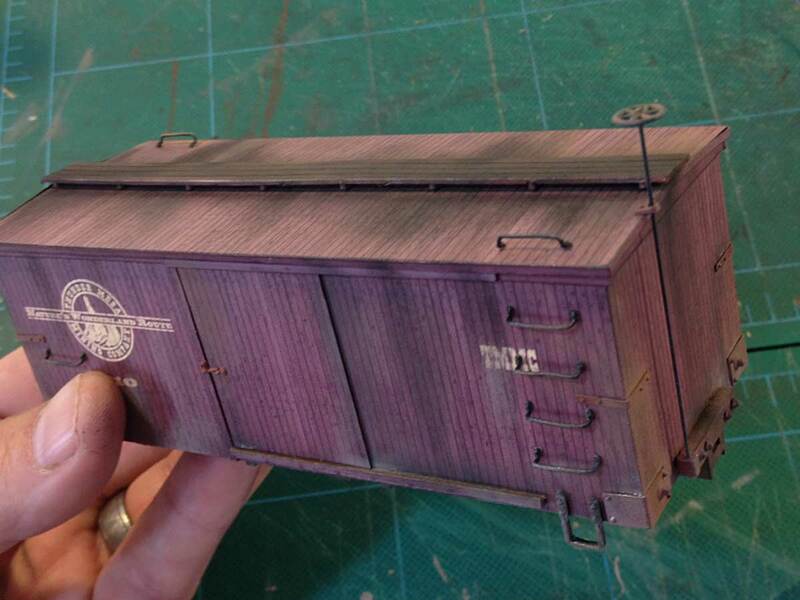 This one came from an old Acurail HO freight car. With careful measurement and assembly, the frame fits nicely within the new car body. A roof was created using the same photo-texture laminated over illustration board process. The roof walk was salvaged from the same Bachmann On30 boxcar that lent the frame. 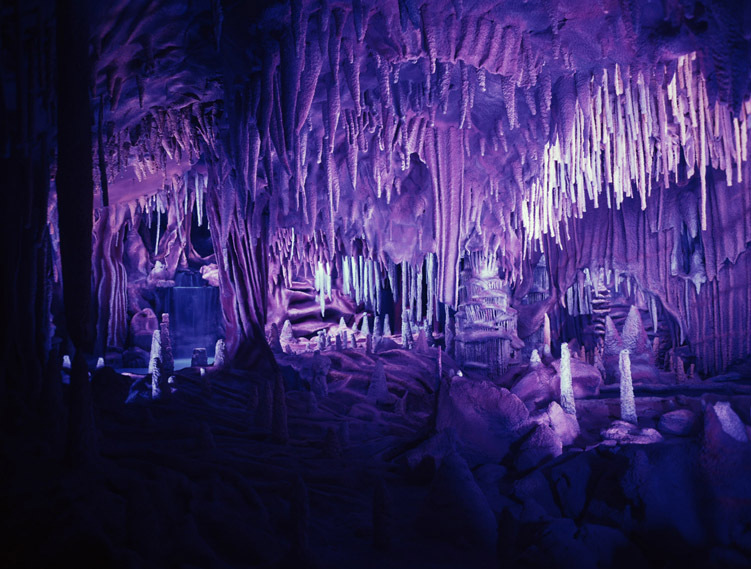 It was painted a matching color and then blended in and weathered with colored chalks. 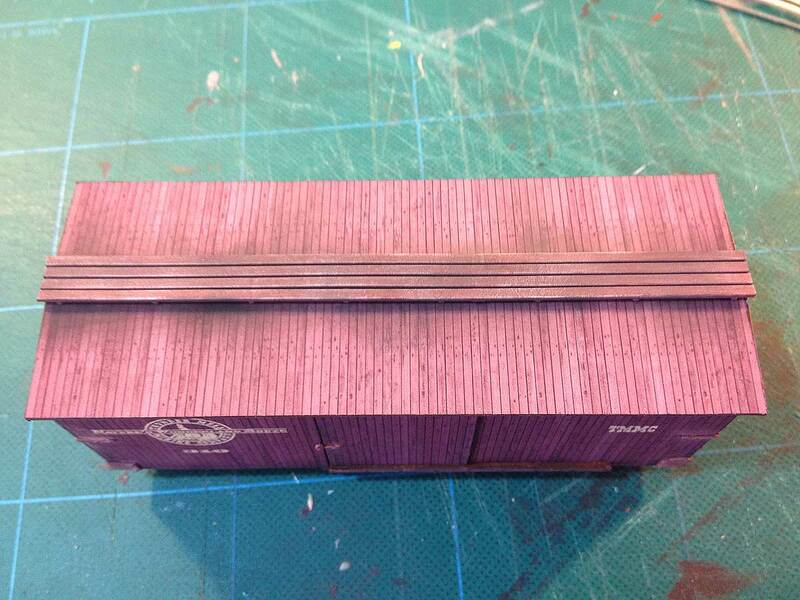 Grandt Line narrow gauge boxcar corner braces were added to detail the car ends. 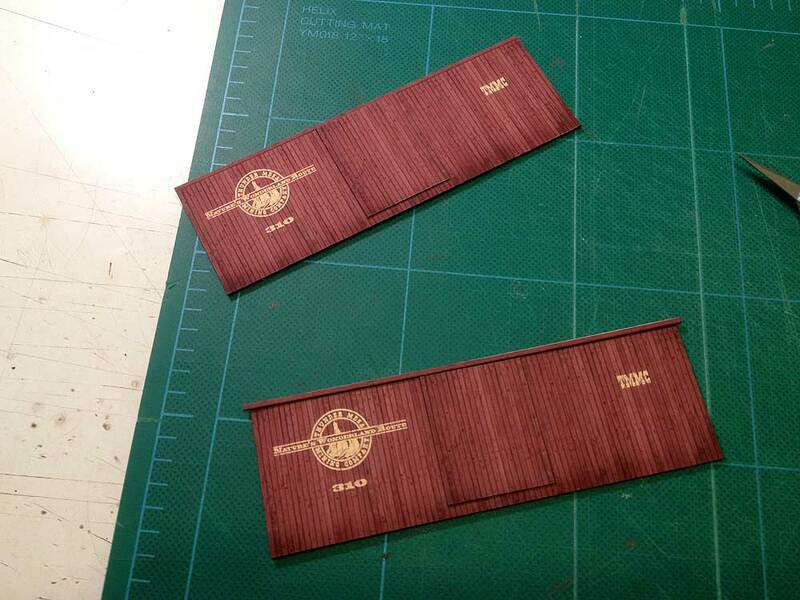 Door guides were created with printouts from the original plan, laminated over 100 lb bristol board. The door latches are from Grandt Line. Coupler blocks were made for each end from scale 4x6" stock and Grandt Line nut/bolt/washer castings, painted and then cemented into place. To ensure that the stirrups and grab-irons would line up properly, a jig was made from 100 lb bristol board, indicating the position and spacing where holes needed to be drilled in the car sides. The grab irons and stirrup steps are white metal castings from Wiseman Model Services. 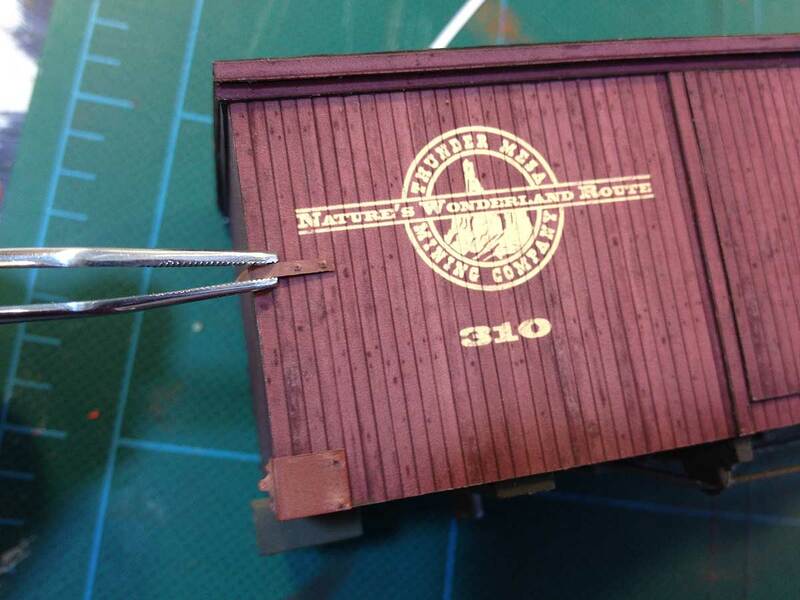 The brake wheel, stave and fittings are from a Bachmann boxcar. When modeling with photo-textures, much of the weathering is already built-in. However, a little weathering with colored chalks is helpful for blending components together and adding details like dust, rust, grime and coal cinders. Care should be taken not to obscure too much of the printed on detail. 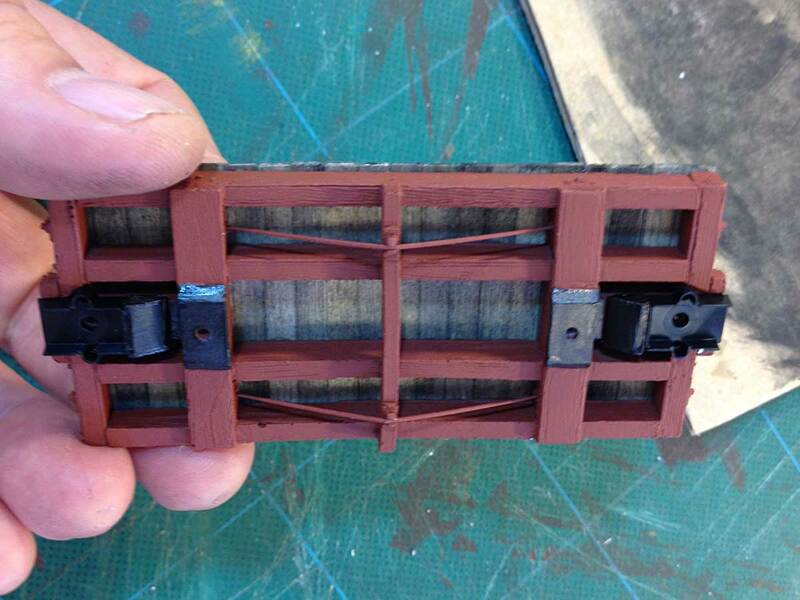 To finish the car, Bachmann arch-bar trucks were painted, weathered and installed, and Kadee #5 couplers were dropped into the coupler pockets. 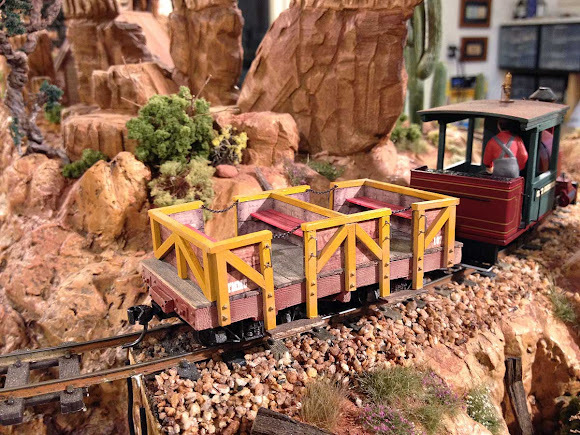 In the future, I may replace the Bachmann wheels and trucks with smaller ones from Boulder Valley Models to make the car ride lower. 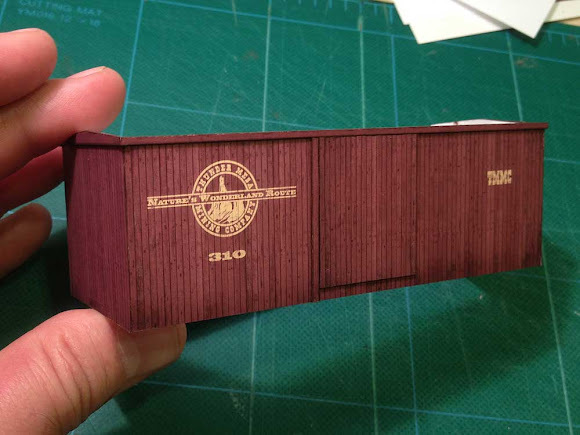 With my new boxcar proudly riding the rails of the TMMC, I turned my attention to some possible future projects that will make the most of this photo-texture modeling technique. Here's a preview of some other boxcars I'll be creating for interchange traffic with the TMMC. Some of the names may be familiar. A car paying tribute to the late, great Ward Kimball. 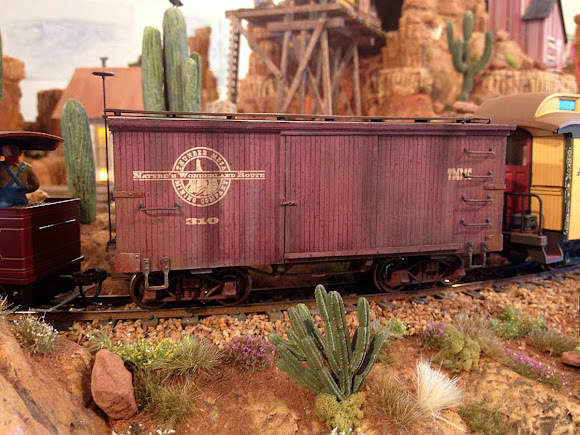 A boxcar to carry explosives for the Lytum & Hyde Co. out of Sparks Nevada. John Olson's HOn3 Mescal Lines Ry. was always a great inspiration for me. Freight bound for down-river travel via the Western River Expedition Co. will ship in this handsome car. Photo-texture modeling is a promising technique for any number of projects that need crisp, clear graphics. 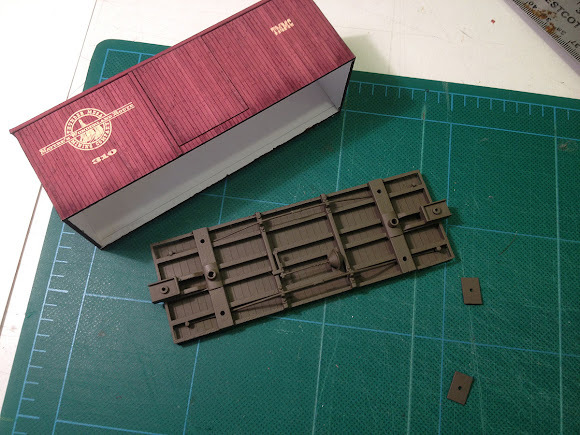 Though only recently finished, I actually started the boxcar before building Combine 101 and the project was mostly an experiment to see what was possible; what the plusses and minuses of this technique might be for rolling stock. Next time around I'm sure I'll do a few things differently, like wrapping the printed textures completely around the car ends to avoid gaps and visible joints. All in all though, I'm pretty happy with how the car turned out and really enjoy watching it ride the rails on the TMMC. Thanks for checking in, everyone. Adios for now! 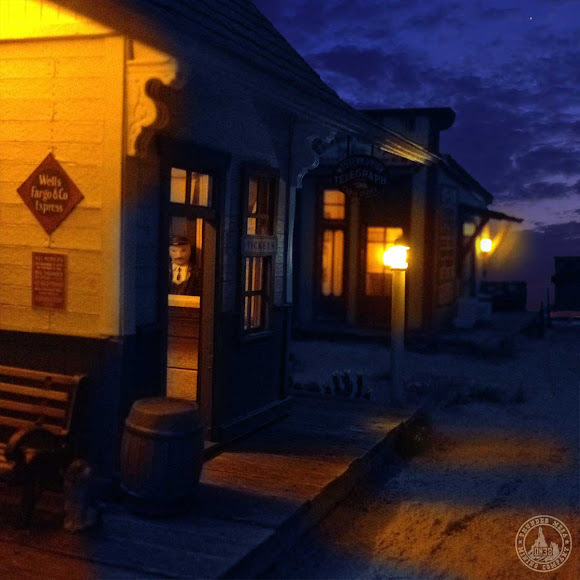 First light paints the sky to the east as the station master prepares for another busy day at Thunder Mesa Depot. 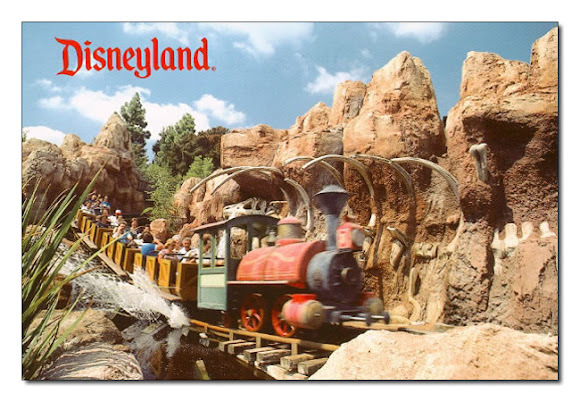 Two Year Anniversary of the Thunder Mesa Blog! My, how time flies! I started this site back on April 1st, 2012 to document the construction of my On30 Thunder Mesa Mining Company layout and here we are two years later. It's been a great ride so far and I continue to appreciate the great feedback I get from followers and the many friends I've made in the hobby. Thank you all! Two years ago: April 1, 2012. Last month: March 1, 2014. 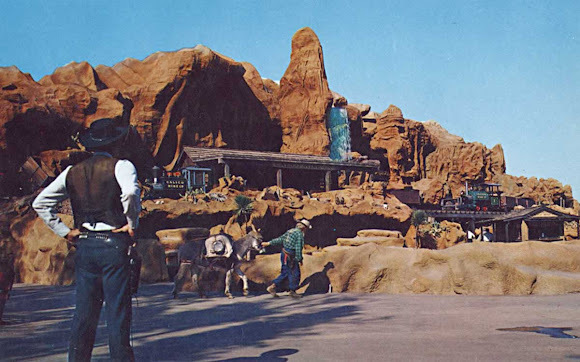 Nothing has changed in the expansion area so I'm just focusing on the original Thunder Mesa section this month. 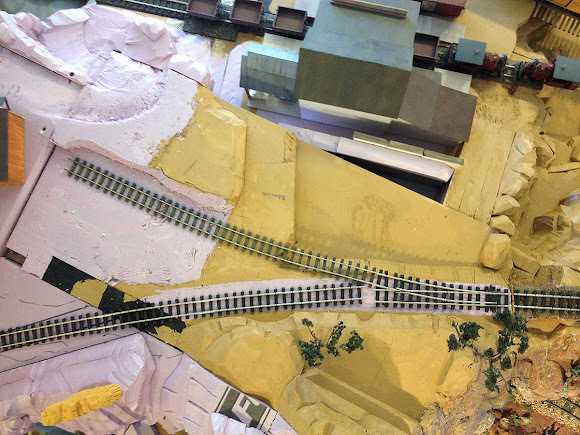 For a more complete view of the layout's progress to date, check out the Layout Construction slide show on the Photo Albums page. 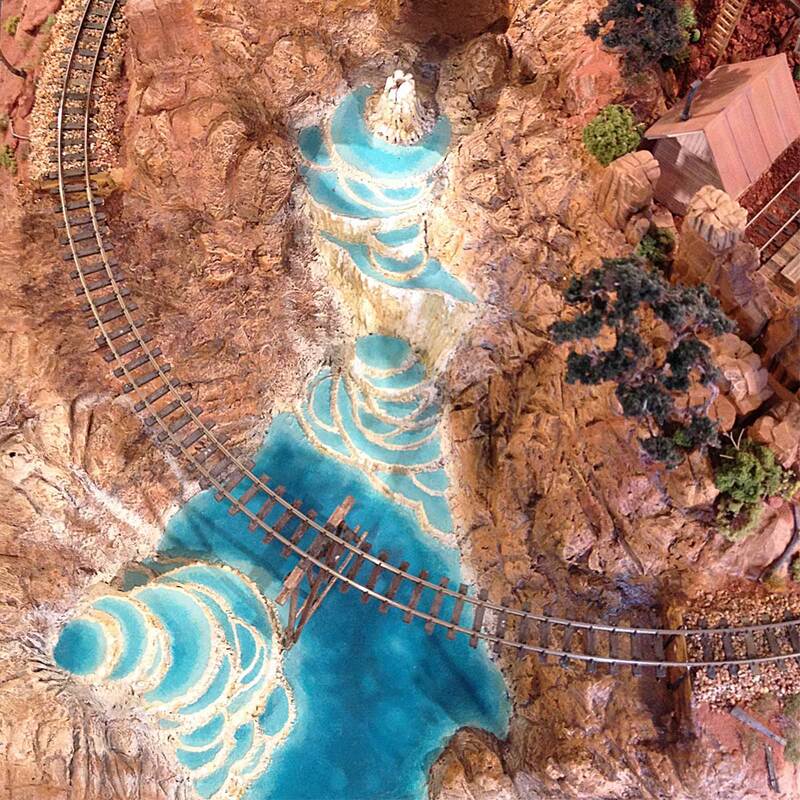 Zooming in we can see the recently completed scenery around Saguaro Siding. It looks like the Marc F. Davis is getting ready to dump another load of leaverite at the tailings trestle. Drifting northwest, we pass over Geyser Gulch. There's still a trestle that needs building here. 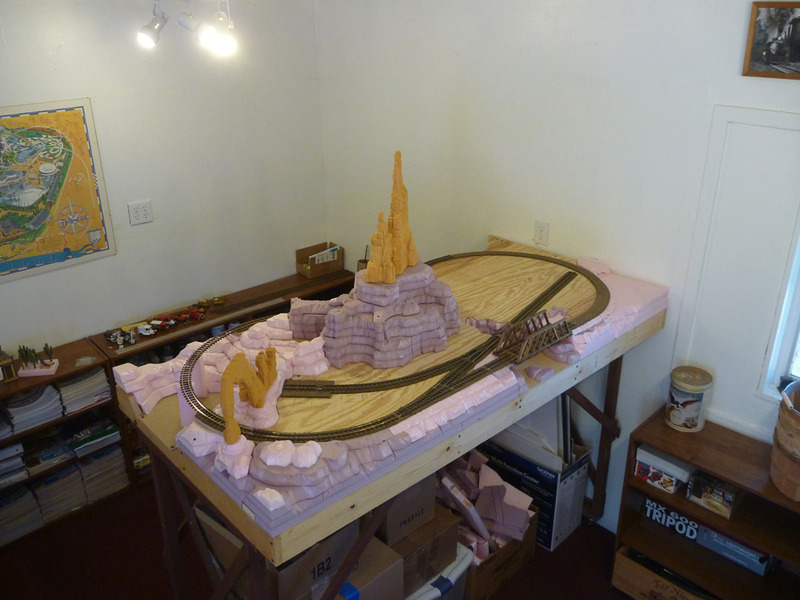 Maneuvering our imaginary airship around Baxter's Butte reveals new track work underway on the High Line. The previous On18 track has been removed and Peco On30 track is being fitted in place. 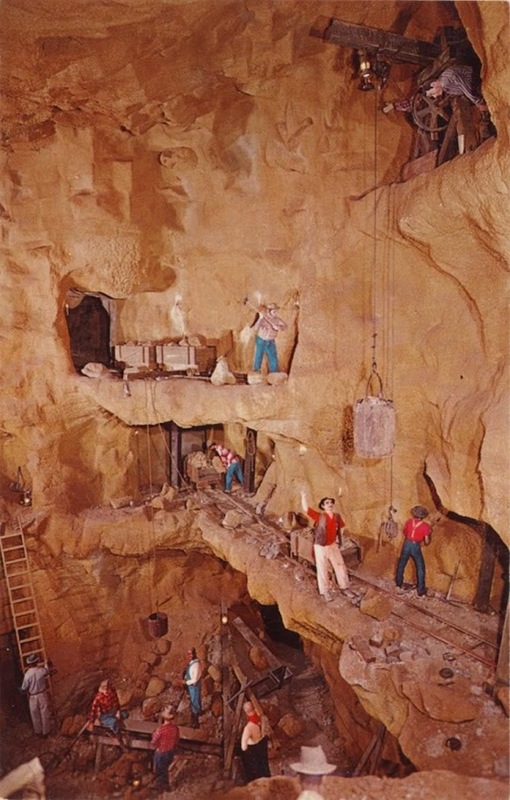 Soon this area above Rainbow Caverns will be home to the Big Thunder Mine and some stock pens. Checking our map, we can fly over to the depot area to see how this scene is progressing. 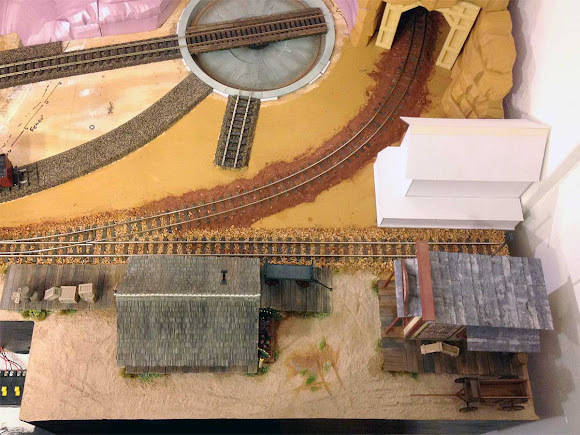 The recent addition of Rainbow Desert Freight Lines has inspired me to bring this newer corner of the layout closer to completion. The depot scene extends from the tunnel portal to the end of the depot platform and includes three structures: Thunder Mesa Depot, Rainbow Desert Freight Lines, and a freight house for the Santa Fe, Denver & Carolwood R.R. 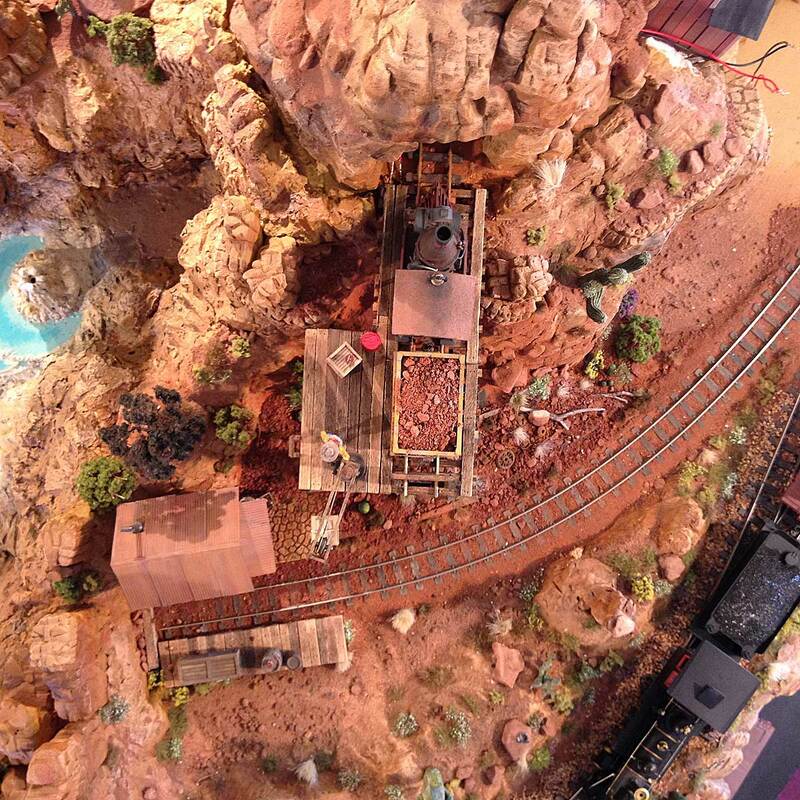 From directly above the depot scene we can see that some ground cover and plants have been added, and that the track has been painted and ballasted. 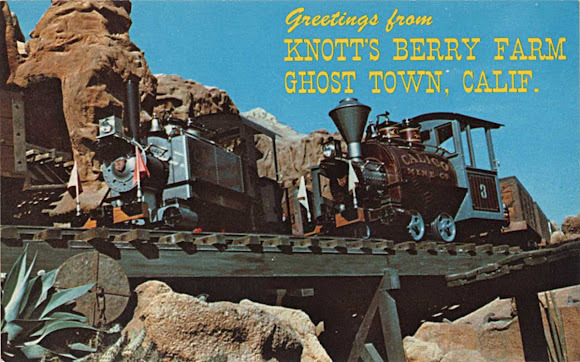 The white structure is a card-stock mock-up for the Santa Fe, Denver and Carolwood freight house. 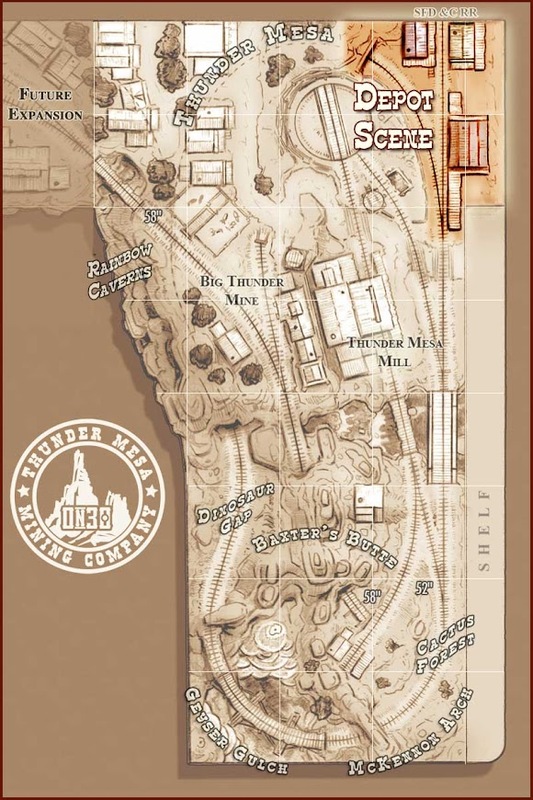 Here's a closer look at the track. 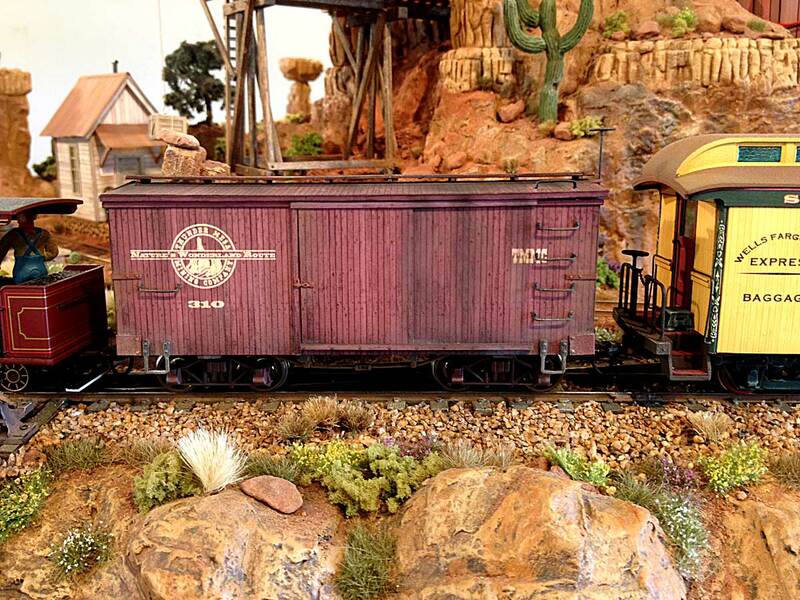 The mainline ballast is dyed chick grit and the sidings are red sand from Sedona, AZ. 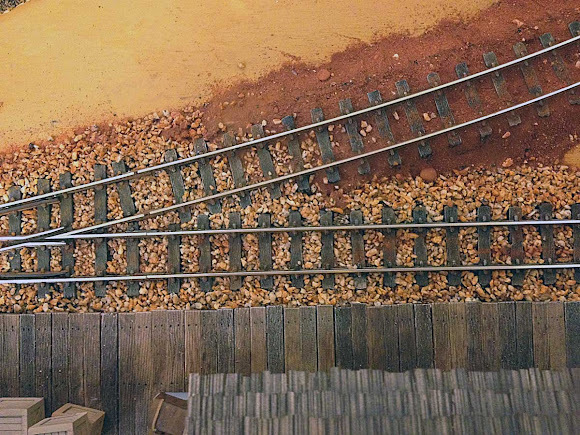 The track itself was painted with Floquil paint pens; Rail Brown, Rust, and Tie Brown, then highlights were added with dry-brushed acrylics. Two new lamp posts have been installed adjacent to the depot platform. The lamps are 2.5mm yellow flickering LEDs built atop juice box straws. Rainbow Desert Freight Lines has acquired a wagon from Grizzly Mountain Engineering but is still waiting on a team of horses. A small cactus garden has sprouted up next to the depot platform along with an assortment of springtime weeds. The ground cover in this area is Polyblend sanded grout and the mud puddle was made with Woodland Scenics Realistic Water. 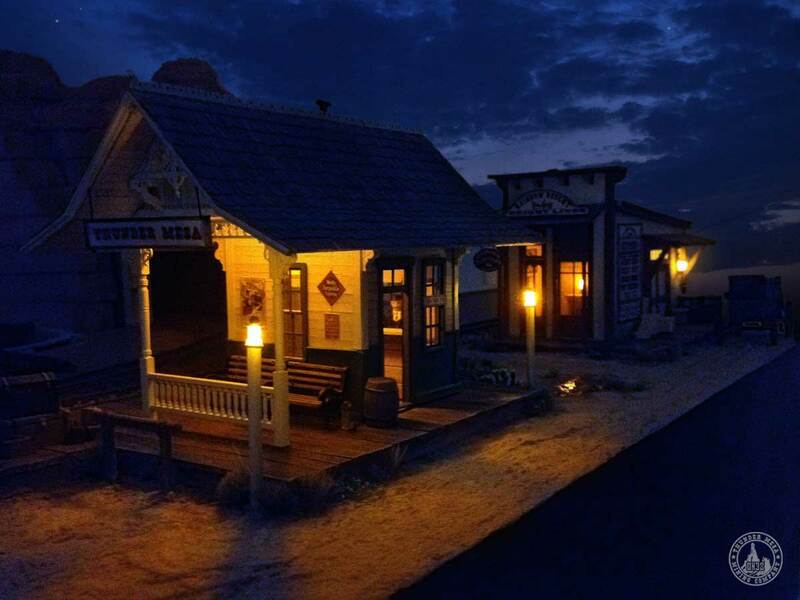 Another night shot of the scene with all the lights aglow. The sky was added in Adobe Photoshop but all else is as modeled. It's the magic of scenes like this that keeps me building. 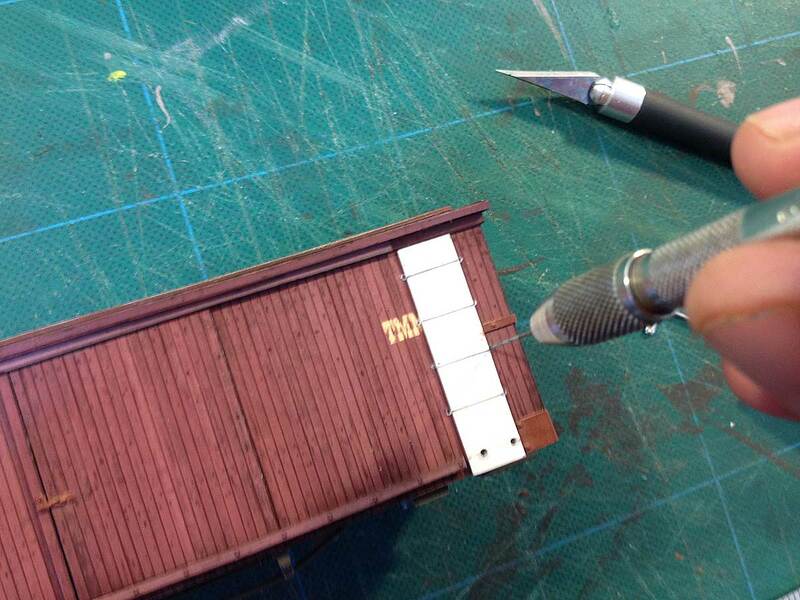 Some good progress has been made on the depot scene but there's still loads to do before I'll call it finished. The tunnel portal needs work, a freight house needs to be built, and the entire scene needs more weeds and junk, figures, lights and so on. Looks like I'll be busy on this one for awhile! We'll check back in with more aerial views next month to see how things have progressed. As always, questions and comments are most welcome. Thanks for checking in. Adios for now!